Team Bilateral is a place where individuals with bilateral lower extremity limb loss can find information and guidance relating to their situation. This site is supported by Dream Team Prosthetics LLC as an informational resource for individuals with bilateral limb loss. Our clinical team specializes in the development of technology and protocols to benefit individuals with bilateral above knee limb loss. We work directly with industry componentry manufacturers to help improve technology for specific use with bilateral prosthetic systems. Patients from all across the world travel to our 6,300 sq. ft. state-of-the-art prosthetic facility for exemplary treatment and training. Every year we host a multi-day Bilateral Life Camp for individuals with bilateral limb loss to be exposed to new developments, peer support and community re-integration activities, helping them to become more proficient with their prosthetics. Individuals with bilateral limb loss travel to our Bilateral Life Camp from all across the United States and from around the world for this unique peer interactive event! 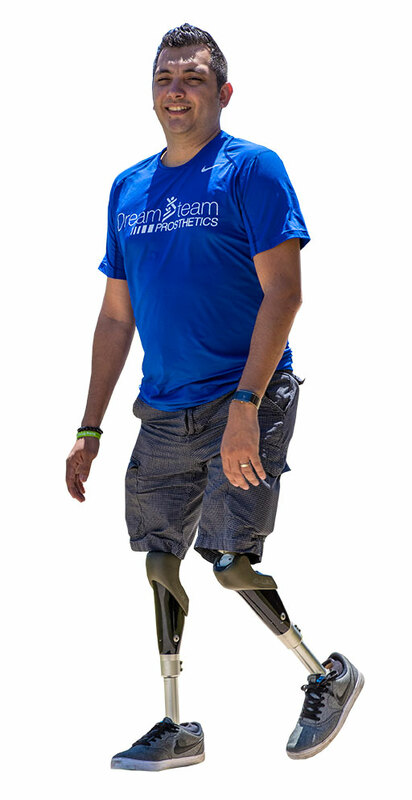 We are committed to advancing prosthetic designs and treatment protocols for individuals with multiple limb amputations as well as individuals with very challenging limb conditions. Our skill and expertise with customized socket designs for individuals with bilateral above knee limb loss allows us to accommodate the unique socket issues that can develop for these individuals. Consideration must be made for the interaction between both sockets, especially at the proximal brim to address pinching and promote a more efficient and anatomical alignment of the prosthesis.